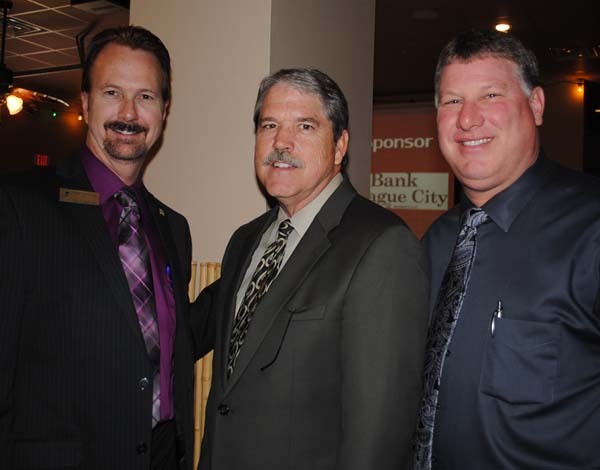 League City Mayor Tim Paulissen, left, welcomes State Sen. Larry Taylor, center, and Galveston County Sheriff Henry Trochesset to the League City Chamber State of the City Luncheon at La Brisa. While the city’s population is only about 85,000 now, “it will be 160,000 in a few years, so we need to be preparing now. Financial management – Reduce the city’s debt and hire a city auditor to identify efficiencies and savings. Economic development – Encourage commercial growth while managing the residential pace to bring the city tax base, which is now 80 percent residential, into balance; encourage private development; streamline the permitting processes; and make sure we’re treating everyone equally. Beautification – Seek help from local landscaper on the city entryways. “You don’t get a second chance to make a first impression;” invest in public improvements along Main Street. Meanwhile, he said, “don’t forget the basics,” going on to mention improvements to traffic, sidewalks, drainage, the water supply, work on various roads that should result in a 30 percent increase in traffic capacity and the start of construction on the new public safety building for police, fire and emergency management. Key to accomplishing all this, he explained, is protecting the taxpayer, keeping the city’s financial position as strong as it is today. “We have ample reserves, our debt load is strategically managed and under control, and our revenues are strong as the economy shows signs of recovery.” The city needs to continue to hold taxes low. “We have had three consecutive tax cuts and now have the lowest rate since Ronald Reagan. “Like a young and growing family that borrows for major investments such as a home or car, League City may need to spread the cost of necessary infrastructure over a reasonable period of time – while not overburdening ourselves or the next generation. When people talk, we listen, he said. “The 518 access management project was withdrawn for more study, and after November’s clear vote on red light cameras, we’ve already gotten one removed more than 18 months ahead of schedule.